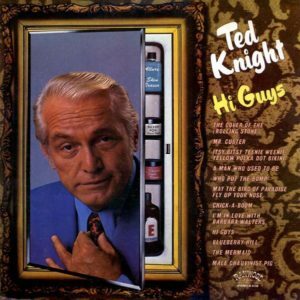 Here you find something that’s a lot of fun if you enjoy Ted Knight. His very own comedy album. It really just needs to be heard, there’s not a lot for me to add. The only story I can relate was from my grandmother. When Ted was back in his hometown (see other parts of the site on that), he signed a copy and dedicated it to my grandmother. When he saw her with it, he actually laughed and told her he was surprised she’d found a copy! At that time, I was a member of the “Doodletown Pipers,” and also a studio singer. The sessions were lots of fun. Ted was funny, on and off camera. I remember when he walked into the studio for the first time, he looked at the hot young receptionist and said (in his inimitable voice), “you could make an old man very happy.” We all laughed. He also pointed to a page about the album from the bass player, Lee Sklar. It contains a lot of production information, notably the writers. As for the album. You can download a zip file that contains the songs and cover art in what should be a Windows Media and iTunes friendly format. Here’s the download. I have to extend a thanks to Mark Allen, who both helped with cleaning up the audio I was able to get off the record, and for nudging me time and again to get clearer tracks up on the site.